The New Le Capri Coffee Machine from Darenthmjs. 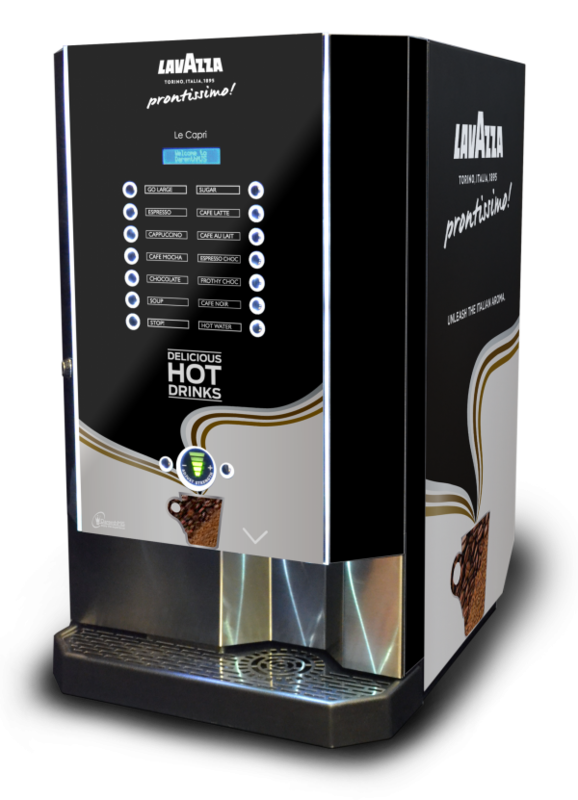 The New Le Capri coffee machine has just been launched by Darenthmjs, who are one the UK’s oldest and most respected coffee machine manufacturers. KSV have been an authorised distributor of Darenthmjs machines now for over 30 years, and are proud to be amongst the first to add this latest model to our range. Fast and efficient, with drinks dispensed in seconds at the push of a button. The ideal system for cafes, bars, restaurants, hotels and retail outlets. The Le Capri features 14 one touch selection keys as standard. Pre-programmed for 9 delicious speciality beverages plus sugar, hot water dispense and STOP! Leaving 2 keys spare for additional product choice. Graphical Strength Adjust feature is fitted as standard. Optional Go Large and Go Decaf are also available. Free vend as standard, but there is an option for coin-operation if required for self-service locations. This model is also compatible with the unique I-Key cashless system. The Le Capri has three, four or five integral product canisters for coffee, milk, chocolate, decaf coffee and sugar. Example drinks menu choices: Café Noir – Espresso – Café Latte – Cappuccino – Café Au Lait –Café Mocha – Espresso Choc – Chocolate – Frothy Choc – Sugar – Hot Water. The striking but simple design also incorporates LED lighting accents. Available in ice white, radiant red, electric blue, sunset orange and jade green. The standard generic model is finished in stylish gloss black, but is also available at no extra cost in Lavazza Prontissimo branding as shown here. For full details and lead times for this exciting new model, please contact one of our helpful sales advisors during normal office hours.